Our Story - Precision Tool Distributors, Inc. 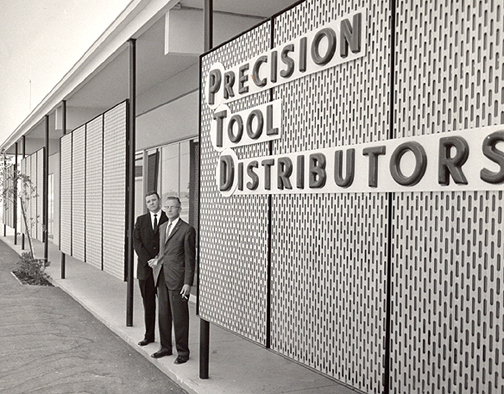 Precision Tool Distributors, Inc. was established in 1963 by our founders, John Reichle and Jim Peterson. John and Jim had already established themselves locally as dimensional measurement specialists at the time Precision Tool opened for business. Originally located in Mountain View, CA, our success and growth enabled us to move to Sunnyvale in 1989, and then to our present location in Santa Clara in 2004. These larger facilities provided the means for Precision Tool to expand our already- spacious inspection lab, and improve our Contract Inspection Services program, offering a large variety of economical, on-time services to the QC community. Precision Tool celebrated its 50th year of business in 2013 and continues to carry on the legacy of quality and service established at the start by John and Jim. John Reichle and Jim Peterson at the original location in Mountain View, CA. 1963. Jim Naples, Geoff Ganz, John Reichle, Frank Black, and Sheri Meskimen in 1989.